I’m being weasel-y, but with good reason. I’m taking advantage of one of the mind’s most powerful tools against fear: the ability to take action. Having options or a sense of power over our circumstances makes it a lot easier to maintain calm. Back in WWII, psychologists found that fighter pilots experienced less trauma in combat than bomber crews, because they were in control of their planes, while bomber crews had to wait passively for the action to start. 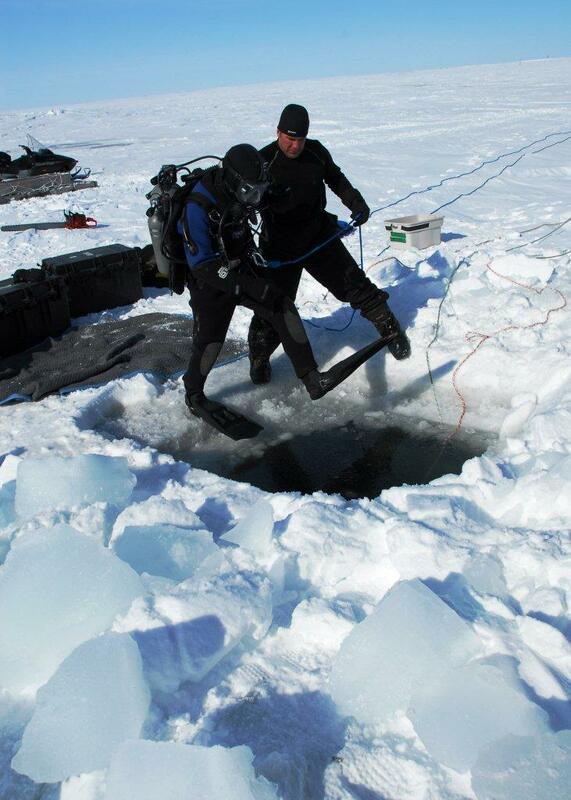 The longer I can postpone making a commitment to this ice-diving adventure, the more control I’ll keep. The day of the dive arrives, and my anxiety level is climbing. Over breakfast I meet with the divemaster, and he asks if I’m excited to go. Not really, I say. Why not, he asks? Because, I say, I’m worried about my fear spiraling into a fatal panic. He shrugs. “If there’s any question about someone’s willingness to dive, I don’t want them under the ice,” he tells me. 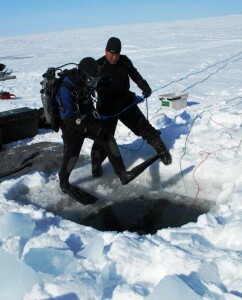 He explains that if I freak out and block the hole, I’ll endanger the two other divers who will also be under the ice with me. It sounds like we’re on the same page. Obviously, I shouldn’t go. But a funny thing happens as we talk. I find myself getting less and less nervous. I’m benefiting from the second most powerful tool against fear: knowledge. The more relevant information we have about a potential threat, the less stressful it is. As the divemaster describes the setting, the gear, and what we’ll be doing, I discover my fear has boundaries. It shrinks. I get fitted with equipment, then we climb onto snowmobiles and head out out across an endless white expanse. Here and there the wind has scoured away the snow, exposing ice as black as night. The thought of being on the other side of it gives me the willies. After a few miles, we stop, unload our gear, and suit up with alacrity in the 10 degree air. Ready? Ready! The two other divers jump in and I follow. To my surprise the water doesn’t feel cold at all, thanks to my dry suit. That’s one big worry out of the way. Now it’s time to descend. I let out air from my buoyancy control device and slide past icy walls. I emerge into a murky cave space about four feet high, with a sandy seabed sloping downward below a whitish-gray flat ceiling of ice. My heart is pounding. I begin to turn. My feet are floating upwards, my back spiraling down. I flail and stir up sediment until I’m in zero visibility. Turns out I’ve failed to open a valve to release excess air from my suit, and now it’s trying to lift me toward the surface while my heavy metal tank drags me down. Here I am, under the ice, struggling upside down, and all but blind. The thing is, I don’t mind so much. I’m not totally out of control. With some effort, I can awkwardly twist myself around, let out some air, and settle on my hands and knees on the bottom. Now I have time to really take in the strange world around me. As the sediment clears, I look at the patches of mussels on the seabed and the patterns of light and dark in the ice overhead. There’s no more fear. That awful sense of mystery is gone. And while I may barely know what I’m doing, I’ve got a tentative feeling of being of control. Armed with the two weapons against fear, my stress level sinks to zero. I’m in a whole new world, and it’s wonderful. (A version of this essay originally appeared in the October 2011 edition of Red Bulletin magazine). I was a diver in the Navy stationed in Norfolk, VA. During the winter of 77 the Chesapeake Bay was frozen over and we had to make our dives in 1/4″ wetsuits. Foolishly thinking that wearing long johns beneath our wetsuits would keep us warmer…I went hypothermic a few times inspecting the hulls of aircraft carriers, oilers, destroyers, etc. All that for an extra $65 a month. I got out of navy diving to stay topside and work in the engine rooms! Damn! The great thing about drysuits is that you never have to go through that awful first minute when the cold water seeps down your back and into your armpits. I can’t imagine what that must have been like in 20 degree water or whatever it must have been, for the salt water to be freezing over.